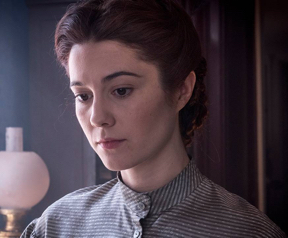 February 2016 — PBS’s Mercy Street is a U.S. Civil War drama about the staff at a Union military hospital in Virginia that treats the wounded from both sides. 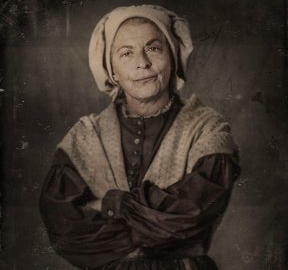 The show’s central character is abolitionist nurse Mary Phinney, who is inexperienced but smart, resourceful, and forceful in fighting for patients. 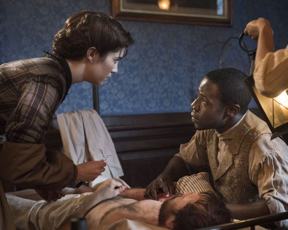 A minor theme in the first season, which finished this month, was the roots of modern nursing in the U.S. Characters included the fierce Union Army nursing superintendent Dorothea Dix (briefly) and a former colleague of Florence Nightingale named Anne Reading, who appears here as the jealous, petty Anne Hastings. These nurses emphasize order, hygiene, comfort, and wound care. But the nurses struggle to cope with the carnage they confront, as well as some surgeons who try to bully them or don’t want them there at all. 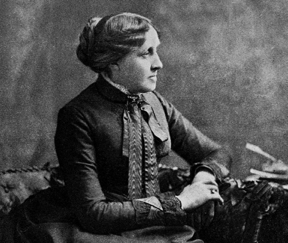 Phinney is based on a real historical figure who wrote about her experiences, and to some extent on Louisa May Alcott (right). Phinney is appointed as head nurse of the hospital despite being new to the work. And she is tentative at first. But she eventually does some creative patient advocacy, for example in working around the corrupt hospital steward to get her patients better food and later in allowing a dying soldier the illusion that his wife back home has remained faithful. One of Phinney’s main tasks in the first season is providing aggressive rehab care to the gifted but morphine-addicted surgeon Jed Foster. By the end of the season, these two have become strong clinical allies. It’s true that the technical health knowledge here seems to reside mainly with the surgeons who call most of the shots. And the show spends most of its time on wartime intrigue outside the clinical setting. So it’s not clear how much it will increase public understanding of modern nurses. Still, it offers a fairly serious look at nursing during this period. We thank creators Lisa Wolfinger and David Zabel. The first episode features a brief appearance by the formidable Dix. The military nursing leader assigns Phinney, an abolitionist New Englander, to an Alexandria hospital and makes her head nurse there even though she is new to the profession. This does not endear Phinney to Hastings, who is recognized even by the surgeons at the hospital for her expertise in wound care, but who is also a nasty schemer determined to advance the career of her military surgeon lover Byron Hale, even though his abilities seem very limited. In fact, Hastings is reminiscent to some extent of the Margaret Houlihan character in the early years of M*A*S*H, when the skilled but abusive senior nurse Houlihan was trying to make something of her lover, the inept surgeon Frank Burns. In any case, Hastings is not a helpful portrayal of an experienced nurse or a Nightingale disciple–like the early Houlihan, Hastings seems to be a battle-axe who would rather bully junior nurses than support them. And the show takes pleasure in seeing Hastings’s plans come to nought. In the sixth and final episode, she shows up in the clinical setting drunk, in despair at Hale’s failure to secure the assistant chief surgeon position; that job has gone to Foster even though he didn’t really want it. Hastings is balanced to some extent by the tough Matron Brannan (right), who seems be considered a nurse but spends all her time overseeing housekeeping and other logistical issues, and so does not seem to be too involved in direct care at the bedside. Brannan is gruff and jaded, but she cares about the work and is even willing to help Phinney. The show does not make clear how much training any of the nurses have. Phinney tries to provide competent care, advocacy, and leadership in the face of terrible wounds and resource shortages. 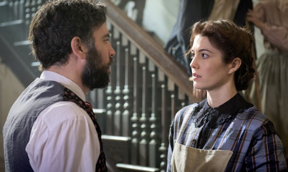 In early episodes, she squares off with the corrupt hospital steward Silas Bullen, whose misdeeds include diverting food resources, leaving the patients short. Phinney tries to persuade Bullen to change his ways, but meeting no success, she goes to the chief surgeon Alfred Summers, who seems to function as head of the hospital. Summers tells Phinney to get the head nurse to resolve it–meaning fix it herself. She manages to requisition food from a different source, working around the steward. In another effort to improve the larger care environment, the second episode has Phinney trying to improve the ventilation at the hospital. Much of the show involves Phinney’s growing bond with the surgeon Jed Foster (right). One major issue is her handling of his morphine addiction. Foster’s real breakdown comes when he needs to amputate the leg of his own brother–a Confederate soldier, since they come from a slave-owning Maryland family. Phinney basically keeps this surgery on track, reading a text on the procedure to Foster when he seems unable to manage that himself, and forcing the even less experienced nurse Emma Green to assist despite her revulsion with what is involved. Once Phinney sees that the addiction has made Foster unable to function, she gets his grudging consent to care for him in a room at the hospital. There, she basically quarantines him, handling his physical needs, managing his abusive and deceptive behavior as he recovers, and fending off the prying eyes of Hastings, who is always seeking some advantage. Before Foster is really well, Phinney feels she has to let him help care for the laundress Aurelia Johnson, who has critically injured herself with a self-abortion she resorts to after being raped by Bullen. Foster is able to devise an operating strategy, but he still lacks a steady enough hand to implement it. That task falls not to Phinney but to African-American hospital worker Samuel Diggs (below), an ally of Phinney’s who trained extensively with a progressive physician he served in Philadelphia. Phinney’s deference here is perhaps not great for nursing, but Diggs does have more experience with performing surgery. Eventually, Phinney sets Foster free from his rehab and he seems able to function well, at least for the rest of the season. One plotline late in the season that shows Phinney at her resourceful and empathetic best concerns a badly wounded soldier who has evidently been caught trying to desert the Union Army. Phinney ignores Hale’s instruction that she simply abandon this patient because of his desertion, instead providing sensitive care and getting Foster to do so as well. The soldier confesses to Phinney that he deserted in an effort to return to his struggling family back home. He is also concerned, with reason, that his wife has been unfaithful. Phinney assures him that his wife will write to him soon, without necessarily believing that. And when the wife does finally write, as the soldier is dying, Phinney reads the soldier her letter. But instead of relaying the letter’s apparent message that the soldier’s wife has moved on, Phinney invents a letter in which his wife still loves him and is coming to visit him. The soldier dies in a state of delirium but seems to be thinking that Phinney is herself his wife, who has come to rejoin him as he passes. Of course, there is some deception here, but this approach provides considerable psychosocial benefit to a patient in desperation and great pain, an act of kindness and strength that appears to impress Foster. We are not suggesting that nurses need the approval of physicians in order to excel as patient advocates. But Phinney and Foster provide the moral and clinical compasses for the show. So when they display mutual respect, nursing benefits. On the whole, although the show’s portrayals of nursing skill have been limited, Phinney is a bright, tough patient advocate who has provided good physical and psychosocial care, particularly for Foster and the dying soldier. We thank the creators.